Mbeh Derick from Cameroon signed up 10 new members yesterday, and he is an excellent TBC Trainer. How many new members can YOU sign up in a day? How many new members can YOU sign up consistently everyday? Do YOU think signing up new members in TBC is hard? YOU may have already redeemed YOUR Cookies and now have plenty of Kringle coins that YOU can trade for cash with YOUR Referrals into TBC at 100%, but have YOU been fully trained? Can YOU bring in new members daily on a consistent basis? Can YOU quickly teach those new members how to achieve Rapid Rewards successfully? If the answer to either of those three questions is “NO” then YOU are NOT fully trained. Then, don’t be so quick to jump to 100%! YOU need training! Trainers don’t train others for FREE! That’s why we set up Partnership Agreements, even if they are only verbal agreements. The way a Partnership Agreement works is that either a Sponsor or a Cash Flowing Leader will trade their coins with YOUR Referrals, then they will immediately pay YOU a 50% commission on each of them as they come into TBC. They will train YOU how to sign up new members everyday consistently. Then the two of YOU will work together to help YOUR new members complete and verify their first transactions. YOUR training is NOT complete until YOU have become a sponsoring machine and can bring in new members everyday and can confidently work TBC Full-Time if YOU want. Working TBC should pay YOU better than any other Full-Time job YOU could get. Perhaps even 10 times better!!! 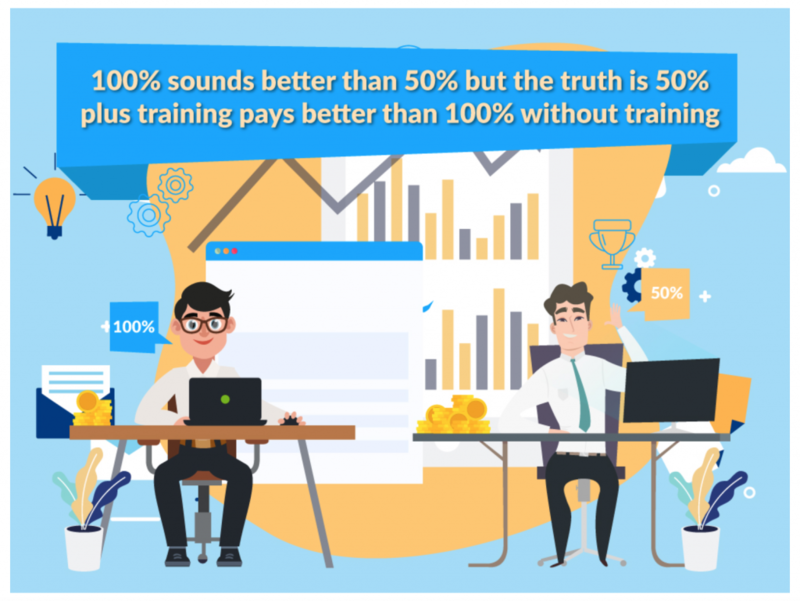 Once YOU are fully trained, and YOU are a sponsoring machine, then YOU can go to 100% on YOUR Referrals from that point forward. Also, YOU will turn into a partnering machine. As a partnering machine YOU will be playing the role of TRAINER. Every new member that YOU train will lead YOU to making 50% from their new members. YOUR income will EXPLODE and as YOU work TBC Full-Time YOU will get paid like a ROCK STAR! Have some integrity, for goodness sake! Don’t gobble up alot of YOUR Trainers time, and then cut them out of the deal. Honor the Partnership Agreement! Expect everyone to honor the Partnership Agreement. Training should be a “Learn-Do” process. YOUR Trainer will teach YOU something to DO, then YOU should DO IT. Then they will teach YOU the next thing to DO, again DO THAT TOO. Step by step, YOU will LEARN the whole process and become a sponsoring machine. When it is time to break the Partnership Agreement YOU should discuss that with YOUR Trainer first, to make sure YOU are ready to become a partnering machine. YOU may spend a couple of weeks getting trained to follow the system, but then YOU will have many months until we reach 1Billion members to duplicate that training as a partnering machine. Don’t try to squeeze YOUR Trainer out of YOUR deals too soon, make sure YOU are ready and have their blessing to go to 100%. Karma awaits YOU. However YOU treat YOUR Trainer, will be how YOUR Trainees will treat YOU. Be an intelligent, fast acting, teachable (humble), Trainee, and YOU will attract likewise back to YOURSELF when YOU become the Trainer.